Spot ethylene markets tracked opposite directions in Asia and Europe during this past week. When looking at the spot prices on ChemOrbis Price Wizard, Asian spot ethylene prices indicate the lowest levels seen since mid-March. On a week over week basis, spot ethylene prices in Asia indicated $40/ton drops both on CFR Northeast Asia and CFR Southeast Asia basis. Lower crude oil prices as well as lower LLDPE futures prices played a role in these declines. Crude oil prices on NYMEX are currently traded below $45/bbl. Meanwhile, the current September LLDPE futures on the Dalian Commodity Exchange indicated CNY215/ton ($35/ton) increases since the beginning of August but the futures prices are still down by CNY950/ton ($153/ton) since the beginning of July. On another note, the trade volumes on Dalian have retreated by 449,632 tons since the beginning of August. 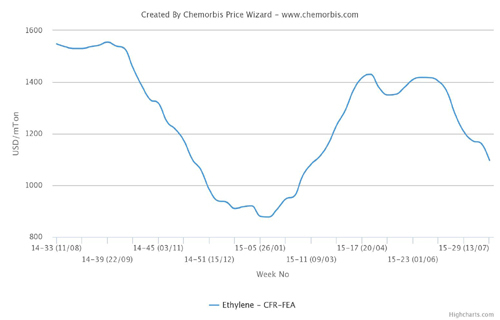 In Europe, spot ethylene prices started to record decreases since the second week of June, according to ChemOrbis Price Wizard. However, this downturn, which lasted about 8 weeks, started to change direction recently. Since last week, spot ethylene prices in Europe started to recover and gained some of the lost ground. 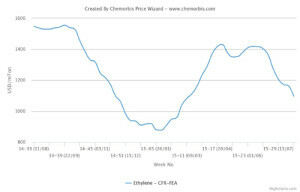 Spot ethylene prices were up by €45/ton during this past week, according to players in the region. Players pointed to tight prompt supplies, supported by lower cracker operating rates in Europe, for this recovery although some comment that spot prices should ease once again when the crackers return to full rates. Total and Ineos’ joint venture Naphtachimie cracker, located in Lavera, France with 740,000 tons/year capacity, Dow’s Bohlen cracker in Germany with 565,000 tons/year capacity and Shell’s Moerdijk cracker located in the Netherlands with 900,000 tons/year capacity are amongst the crackers which have not fully resumed their operating rates after they had been restarted. According to ChemOrbis, apart from the lower operating rates, Ineos is to shut their 740,000 tons/year cracker located in Grangemouth, United Kingdom, for about 7 weeks in early August. Meanwhile, HIP-Petrohemija will conduct a planned maintenance shutdown on their 200,000 tons/year cracker in Serbia, between August 15 and September 15.